I’m positive that you enjoy avocado. In fact, I don’t think I’ve ever met a person who doesn’t like avocado. Have you? Either way, there’s a ton of versatility when working with avocado because you can dice it, mash it, slice it thin, chop it..etc. The crazy thing is, all of those different ways of cutting an avocado effects the way it feels in your mouth and how it looks on a plate. I’m a firm believer that we eat with our eyes, so if you slice an avocado to perfection, it will taste superior. And maybe that’s all in my head, but I really do think it makes a difference. The old me used to just core an avocado by slicing it in half while deseeding it, grab a big spoon, and scoop the whole thing out. While this definitely works for quick situations, it makes for a terrible presentation, and you might even leave some avocado meat on the skin! What I do now is peel the skin. I ALWAYS peel the skin! And yes, it may get your hands a little more messy, but again, it’s totally worth it. So here are the steps to mastering the slicing of avocado! Step 1: Look for avocado with thinner, less bumpy skin! By pushing the ends down, you should feel a little give to confirm that they are ripe. You do not want them to be TOO soft, or the skin will just stick to the avocado meat and most likely be brownish in color. Step 2: Half the avocado and cut the ends. When you cut the ends, it will make your life so much easier when peeling back the skin! Step 3: Peel back the skin while pushing the meat down. If you have a thin skinned avocado, you’ll be able to see how easy it is to peel the whole skin back. If it’s a little thicker, you’ll just have to peel away in pieces, as you’ll notice it will tear before you get to the end. It will most likely be easier to peel in pieces anyway. Step 4: Slice perpendicular and evenly! If you want to cover a larger surface area (ex. large piece of toast), you’ll cut thinner pieces accordingly. 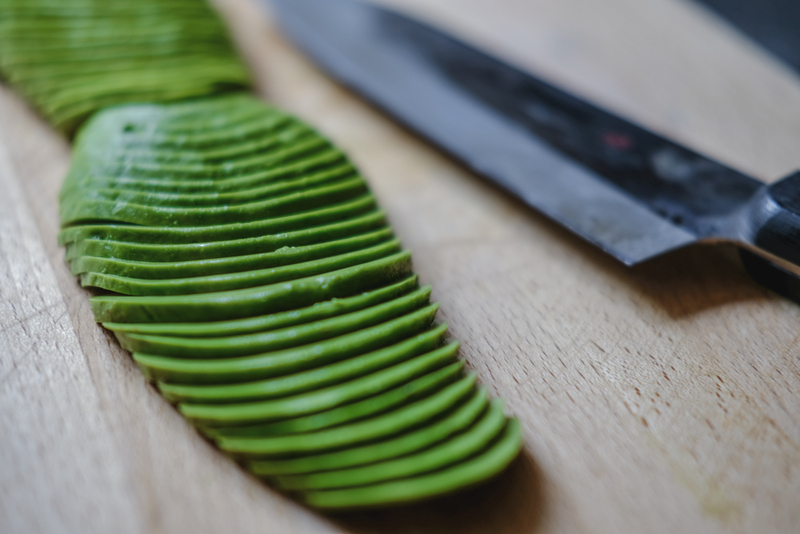 The key to making avocado slices presentable, is making sure every slice is even. Step 5: Spread the avocado out by pressing down on it with your hands very lightly. You could even use the back of your chef knife to do this part too. Again, if you wish to cover a larger surface area, simply press down a little harder, to fan the avocado out to longer width. It’s that easy! Give this a try if you don’t already do this. You’ll never look at your avocado toast the same again! We eat it every day. Also grow our 11 years old own tree. It gave us about 1000 avocados that we gave away last year. Avocado toast is my favorit sándwich.